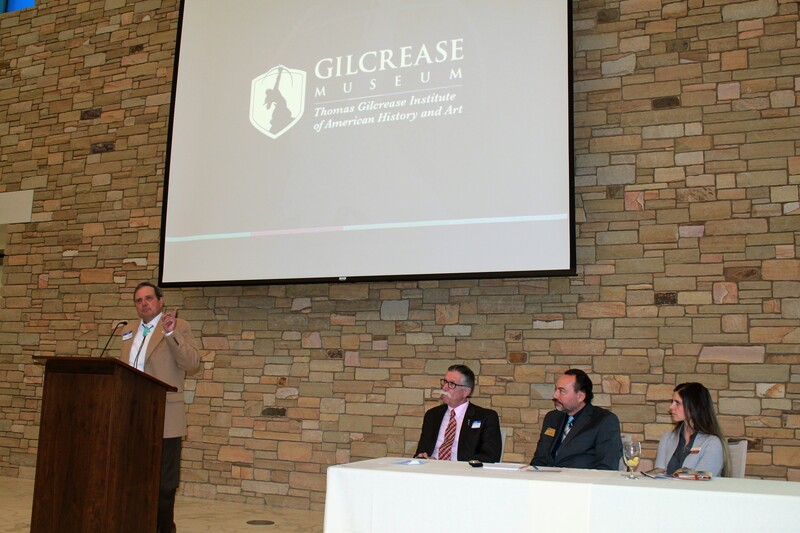 The Osage County Tourism Forum was held from 10 – 2 p.m. on Jan. 27 at the Gilcrease Museum’s Helmerich Research Center, where stakeholders, tourist venue representatives and tourism specialists gathered to share and learn. 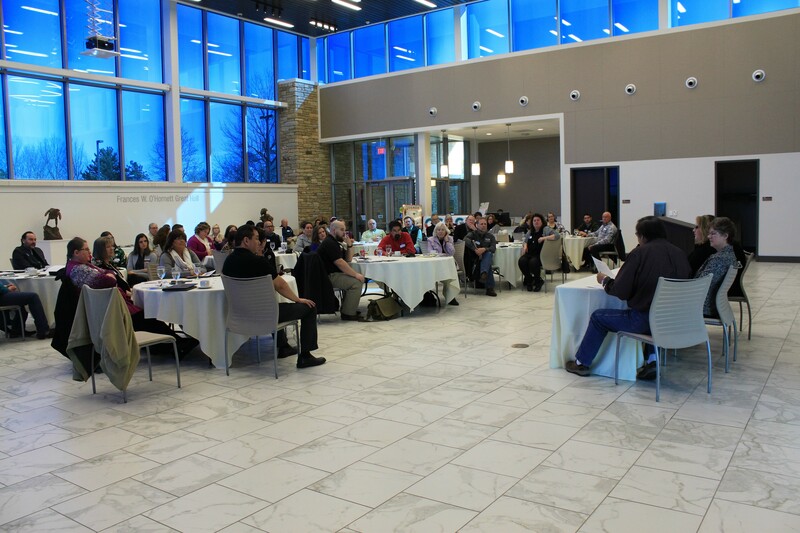 There was a full house at the forum, which included lunch provided by the Osage Casinos. It goes without saying that Ree Drummond’s Pioneer Woman Mercantile Deli/Bakery/General Store, which opened Oct. 31, gave tourism a jumpstart in Osage County. P.W. Mercantile Events Coordinator Jourdan Foran, charged with planning special events at the Mercantile attended the forum. Even before the opening of the Mercantile, thirty-three million impressions are made each year through Oklahoma Travel and Recreation Dept. (OTRD) marketing efforts, said Kimberly Noe-Lehenbauer, an Advertising Account Executive at OTRD. “Tourism is an 8.6 billion dollar industry in Oklahoma. For every tax dollar spent by the Oklahoma Tourism and Recreation Dept., there is a $7 return in tax revenue. 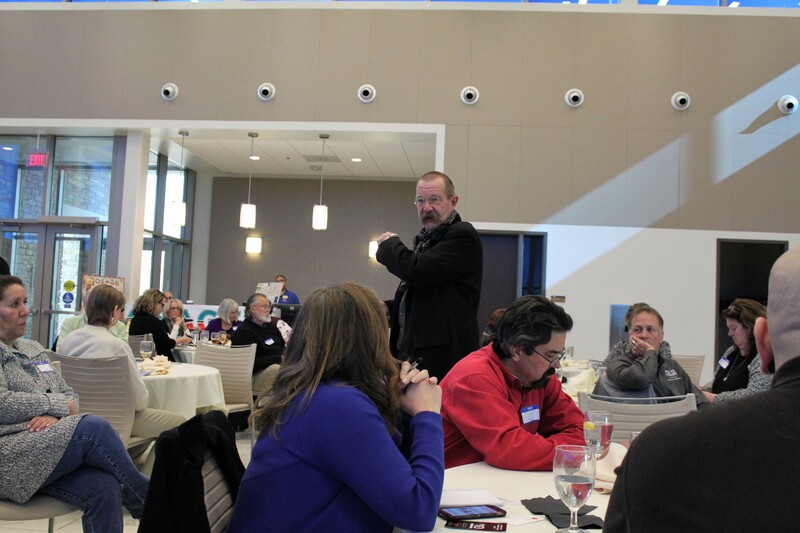 You are impacting the state in a big, big way,” Noe-Lehenbauer said. 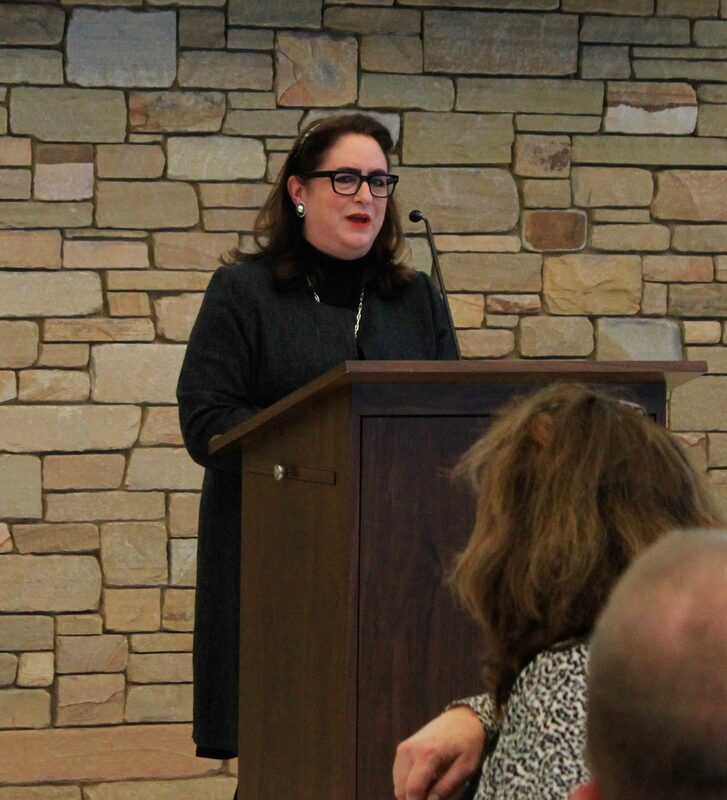 Susan McCalmont, President, Creative Oklahoma, spoke about developing creative ideas. To build tourism in the Osage a collaborative vision is needed with unselfish leadership. She commended the Pawhuska Merchant’s Association for its cooperative spirit, working on weekends to improve the business exteriors in downtown Pawhuska, develop imaginative ideas and test them! Charlotte Ashworth, Green Country Mktg. Dir. of Sales, Kimberly Noe-Lehebauer, Advertising Oklahoma Travel and Recreation Dept., Trisha Kerkstra, POSTOAK Lodge Mgr. and Osage County Tourism Board President, Eddy Red Eagle, Jr., Osage Elder and OCTB member and Osage Industrial Authority Bd. member. Charlotte Ashworth, Green Country Marketing Association (GCMA) Director of Sales, described their 22 publications, each offering individual advertising or advertising in a cooperative arrangement, wherein several companies each contribute funds in order to have a presence collective presence in an ad. Distribution Oklahoma is one of GCMA’s magazines being sent to Tour Bus Operators, Ashworth said. GCMA’s publications include a national magazine published quarterly, another featuring Wedding Ideas and the True West magazine. Ashworth said that staff at G.C. Mktg. can produce brochures, ads, maps, rack cards and banners. “Just tell me what you need and I’ll find it for you,” she said. POSTOAK Lodge General Manager, Trisha Kerkstra, praised Green Country Marketing Association for helping to create trail maps for POSTOAK Lodge, describing their services as excellent and economical. POSTOAK Lodge, which sits on 1,000 acres in the Osage hills, hosts retreats, conferences, weddings and reunions and special events such as their annual wine and jazz festival and a spring marathon for trail runners. Kerkstra encouraged stakeholders to apply for grants. POSTOAK obtained a grant from the Oklahoma Wildlife Dept. to establish a monarch butterfly wait station – an enhancement to their nature trails sure to please lodge guests. Kerkstra, who is also president of the Osage County Tourism Board, said that last year’s tourism budget, derived from the lodging tax, was about $42 ,000. Of that, one-third was used to pay staff, one-third was used for marketing and ads in publications and one-third went toward grants for Osage County events such as the Indian Taco Festival in Pawhuska. The current tourism budget is about $72,000. Kerkstra thanked the Osage County Tourism Coordinator, Roseanne McKee, for her work with the board to develop four tour plans, which have been sent to motor coach companies in the region. McKee also updates the tourism website, http://www.visittheosage.com, with text and photos, and produces a quarterly newsletter, which is e-mailed to contacts, and is available on the website home page. Social media updates for Facebook, Pinterest, Twitter and Instagram are handled by Digital Generator, and the Visit the Osage Facebook page has over 10,000 followers. Osage elder, Eddy Red Eagle, Jr., who is retired from 34 years in management at Citgo, spoke to forum guests about the fact that tourism is an economic driver in Osage County, which increases the need for highspeed broadband internet infrastructure and housing to meet the needs of incoming businesses and residents. The Gilcrease has a signed copy of the Declaration of Independence and the only copies of the Articles of the Emancipation Proclamation, which became the basis for the U.S. Constitution. The Gilcrease Museum has one of the top five American art and colonial art collections in the U.S., the most Charles Russell art in the world and the second largest collection of Remington art in the U.S. The writings of Bob Dylan, who just won a Nobel Prize for writing, are also at the Gilcrease. Only a fraction of the art collection is on display due to limited gallery space, Henry said. Soon, the museum will undergo renovation and expansion to expand gallery space and add needed amenities. Dr. Joe Conner, owner of the Fairfax Chief Newspaper, spoke about tourism efforts in Fairfax including upcoming Saturday art markets at the Tallchief Theatre in downtown Fairfax where local artists will sell their work. Executive Director of Strategic Planning at Woolaroc, Kaci Fouts, spoke about current exhibits, the wildlife preserve, and upcoming events at Woolaroc, including their Christmas Festival of Lights, which welcomed 13,000 visitors in 2016. Other events are the Mountain Man Camp, summer day camp for kids and the Cow thieves and Outlaws Reunion celebrating its ninetieth year in 2017. Describing its ecology, Payne said: “The prairie has to have fire or it will die. Without fire it was a spruce and blackjack tree forest. We do the burning which mimics the seasons…Ninety percent of what bison eat is grass. Called the great American desert by early explorers, when the steel plow was discovered it became endangered. Nowhere else was there a tallgrass prairie. It was coveted by settlers and farmers. The bread basket we have today probably came from the Tallgrass Prairie. “The Nature Conservancy began purchasing the land in 1988. Then in 1993 bison were re-introduced to the Tallgrass Prairie with funded donations,” Payne said. The preserve, free to the public, is privately owned by the Nature Conservancy, which does accept donations. Current Tallgrass Prairie Director is Robert G. Hamilton. Bruce Carter, Tallgrass Art Gallery and Tallgrass Tours owner. Carter is also a member of the OC Indus. Auth. Bd. and OC Tourism Bd. Bruce Carter, owner of the Tallgrass Art Gallery in Pawhuska spoke about ways to market your business and build a service culture. He emphasized the use of social media for marketing your business. He described his new business bringing motor coach tours to the Osage and described taking a tour group to the Tallgrass Prairie for wine and hors d’oeuvres at sunset, and how this added experience resulted in happy tourists. Osage Nation Museum Collections Manager Cali Martin spoke about the changes at the museum since the new curator Hallie Winter began in May 2016, and described an upcoming exhibit: Enduring Images, featuring photos of the Osage taken in the last century. A section of the gallery is also set aside for the work of today’s Osage artists. Another permanent exhibit called “Wahzhazhe Spirit” tells the Osage story. Osage Nation Properties Manager, Bruce Cass, spoke about the nation’s support for tourism, and progress on an eco-park with community vegetable gardens, hydroponics and walking trails in Pawhuska.